Let Himmler speak….stop cutting him off in mid-sentence! Ten years ago, I visited the mansion where the Wannsee Conference took place on January 20, 1942. At this famous conference, the “Final Solution of the Jewish Question” was planned. The mansion is now a Museum with displays in the rooms on the ground floor. I spent a lot of time there and read everything in the displays, using a guidebook with English translations. The last part of the sentence is a reference to 1917-18 during World War I when the Jewish labor leaders called a strike of ammunition workers in 1917 and the Social Democrats overthrew the established government and declared a Republic in Germany in 1918. The part of the sentence, that the museum display cut out, explains why the Nazis made the decision to “transport the Jews to the east” six months after Germany attacked the Soviet Union: they didn’t want the Jews to cause them to lose another war. Why would a Museum leave out such an important detail in the history of World War II? Maybe for the same reason that Peter Longerich, an expert witness who testified for the defense in the lawsuit brought by David Irving against Deborah Lipstadt, left out this part of the speech in his testimony. Longerich testified to the meaning of the often euphemistic language used by German officials during the war regarding the “Final Solution of the Jewish Question”, and argued that from 1941 onwards, the term “resettlement in the East” was a metaphor for deportation to the death camps. During his exchanges with Irving, Longerich insisted quite firmly that the term “resettlement” was only a euphemism for extermination and nothing more, and used the Posen speech given by Himmler in October 1943 as a proof of the genocidal policy of the German state. Irving by contrast argued for a literal interpretation of the phrase “resettlement in the East”. I’m not accusing Longerich of falsifying history. I think he honestly didn’t know what Himmler had actually said, since this part of Himmler’s speech is routinely cut off in mid-sentence. I want to mention another very difficult matter here before you in all frankness. Among ourselves, it ought to be spoken of quite openly for once; yet we shall never speak of it in public. Just as little as we hesitated to do our duty as ordered on 30 June 1934, and place comrades who had failed against the wall and shoot them, just as little did we ever speak of it, and we shall never speak of it. It was a matter of course, of tact, for us, thank God, never to speak of it, never to talk of it. It made everybody shudder; yet everyone was clear in his mind that he would do it again if ordered to do so, and if it was necessary. I am thinking now of the evacuation <Evakuierung> of the Jews, the extermination <Ausrottung> of the Jewish people. It is one of those things that’s easy to say: “The Jewish people will be exterminated” <wird ausgerottet>, says every Party comrade, “that’s quite clear, it’s in our program: elimination <Ausschaltung> of the Jews, extermination <Ausrottung>; that’s what we’re doing.” And then they all come along, these 80 million good Germans, and every one of them has his decent Jew. Of course, it’s quite clear that the others are pigs, but this one is one first-class Jew. Of all those who speak this way, not one has looked on; not one has lived through it. Most of you know what it means when 100 bodies lie together, when 500 lie there, or if 1,000 lie there. To have gone through this, and at the same time, apart from exceptions caused by human weaknesses, to have remained decent, that has made us hard. This is a chapter of glory in our history which has never been written, and which never shall be written; since we know how hard it would be for us if we still had the Jews, as secret saboteurs, agitators, and slander-mongers, among us now, in every city — during the bombing raids, with the suffering and deprivations of the war. We would probably already be in the same situation as in 1916/17 if we still had the Jews in the body of the German people. I have put in the original German for some of the important words in the speech. The English translation of these words is another controversy that is still argued about today. I don’t want to get into that argument now, but I will tell you that David Irving brought in a German dictionary from 1935 during his lawsuit. Today’s German dictionaries are not the same as the old dictionaries from the 1930s. Emil Maurice (19 January 1897, Westermoor – 6 February 1972, Munich ) was an early member of the Nazi Party. A watchmaker, he was a close associate of Adolf Hitler with a personal friendship dating back to at least 1919. With the founding of the Sturmabteilung in 1920, Maurice became the first Oberster SA-Führer (Supreme SA Leader). In 1923, Maurice also became the SA commander of the newly established Stabswache, a special SA company given the task of guarding Hitler at Nazi parties and rallies. He was imprisoned with Hitler and Rudolf Hess at Lansberg after the failure of the Beer Hall Putsch. In 1925, two years after the failed Beer Hall Putsch, Maurice and Hitler refounded the Stabswache as the Stosstrupp Adolf Hitler which was renamed, later that year, as the Schutzstaffel (SS). At that time, Hitler became SS Member nr. 1 and Emil Maurice became SS Member nr. 2. Maurice became an SS-Führer in the new organization, although the leadership of the SS was assumed by Julius Schreck, the first Reichsführer-SS. Maurice became Hitler’s chauffeur. He reportedly had a brief relationship with Geli Raubal, Hitler’s niece, and lost his job as Hitler’s chauffeur. When the SS was reorganized and began to expand in 1932, Maurice became a senior SS officer and would eventually be promoted to the rank SS-Oberführer. While Maurice never became a top commander of the SS his status as SS Member #2 effectively credited him as the actual founder of the organization. Heinrich Himmler, who ultimately would become the most recognized leader of the SS, held SS Member #168. Maurice was with Hitler during the Night of the Long Knives— Maurice shot to death Edmund Heines and his boyfriend on 30 June 1934. He also shot and killed Father Bernhard Stempfle, who had been talking about Hitler’s relationship with Geli Raubal. After Himmler had become Reichsführer-SS, Maurice fell afoul of Himmler’s racial purity rules for SS officers, when he had to submit details of his family history before he was allowed to marry. All SS officers had to prove racial purity back to 1750, and it turned out that Maurice had Jewish ancestry – Charles Maurice Schwartzenberger (1805–1896), the founder of Thalia Theater in Hamburg, was his great-grandfather. Himmler, who had always been jealous of Hitler’s close friends from the early days of the Party, and especially of the lack of control he had over Hitler’s inner bodyguards, was delighted. He recommended that Maurice be expelled from the SS, along with other members of his family. To Himmler’s annoyance however, the Führer stood by his old friend. In a secret letter written on the 31.8.1935, Hitler compelled Himmler to make an exception for Maurice and his brothers, who were informally declared “Honorary Aryans” and allowed to stay in the SS. Despite his Jewish ancestry, and his relationship with Hitler’s niece, Geli Raubal, Maurice was first and foremost a loyal companion to Hitler. Edmund Heines (July 21, 1897 in Munich – June 30, 1934 in Munich) was Ernst Röhm’s deputy in the SA, and possibly one of his lovers as well. Adolf Hitler had a close friendship with Röhm, and to a lesser degree with Heines. Heines served in World War I as a volunteer, and was discharged in 1918 as a lieutenant. In 1925, he joined the Nazi Party and the SA (stormtroopers). In 1929, he was convicted of murder, but soon received an amnesty. That same year, he was appointed to temporarily serve as the head of a Nazi district in the Upper Palatinate region. In 1930, he became a member of the Reichstag for the district of Liegnitz. From 1931 to 1934, he served as an SA leader in Silesia while simultaneously working as Ernst Röhm’s deputy. In 1933, he was on the Prussian privy council, and in May of the same year he became head of police in Breslau. Hitler’s chauffeur Erich Kempka claimed in a 1946 interview that Edmund Heines was caught in bed with an unidentified 18-year old male when he was arrested during the Night of Long Knives, although he did not actually witness this himself. According to Kempka, Heines refused to cooperate and get dressed. When the SS detectives reported this to Hitler, he went to Heines’ room and ordered him to get dressed within five minutes or risk being shot. After five minutes had passed by, Heines still had not complied with the order. As a result, Hitler became so furious with him that he ordered some SS men to take Heines and the boy outside to be executed. Heines, Röhm, and many other SA leaders were executed shortly after their arrest. Hitler identified Heines as one of the principal members of a “small group of elements which were held together through a like disposition” in his Reichstag speech of 13 July 1934. Karl Ernst (September 1, 1904, Berlin – † June 30, 1934, Berlin) was an SA Gruppenführer (Sorry, I have promoted him in my recent post) who, in early 1933, was the SA leader in Berlin. Before joining the NSDAP he had been a hotel bell-boy and a bouncer at a gay nightclub. (Oh, he was a homosexual too? I did not know that). It has been suggested (only “suggested” by William Shirer’ in his foliant) that it was he who, with a small party of stormtroopers, passed through a passage from the Palace of the President of the Reichstag, and set the Reichstag building on fire on the night of February 27, 1933. There is evidence indirectly to substantiate this: Gisevius (Hans Gisevius, another traitor) at Nuremberg implicated Goebbels in planning the fire, Rudolph Diels (another disgruntled Gestapo officer, like Gisevius) stated that Göring knew how the fire was to be started, and General Franz Halder stated that he had heard ( this is clear hearsay testimony) Göring claim responsibility for the fire. On June 30, 1934, Ernst had just married, and was in Bremen on his way to Madeira to honeymoon with his new wife. SA Leader Ernst Röhm had repeatedly called for a “second revolution” that would introduce a Nazi version of socialism into the Reich and banish the old Conservative forces of business and government. Fearing the socialistic tendencies of the SA, Conservative elements in the Reichswehr and Kriegsmarine pressed for an elimination of SA power. Adolf Hitler undertook a purge of the SA — an event known to history as the Night of the Long Knives. Ernst was arrested in Bremerhaven together with his wife and his friend Martin Kirschbaum as he was about to get aboard a cruiser in order to travel to Madeira where he planned on spending his honeymoon. Later on he was handed over to an SS-commando led by Kurt Gildisch flown back to Berlin and taken to the barracks of the Leibstandarte Adolf Hitler, where he was shot by a firing squad in the early evening of June 30. According to the official death list drawn up for internal-administrative use by the Gestapo he was one of fourteen people shot on the grounds of the Leibstandarte. This raises a question about so-called “Reichstag Fire”. I have read the “authentic confession letter” of Karl Ernst long time ago in one of the old fiction books. This letter is nowhere to be found nowadays. Supposedly, Herman Göring kept that letter for almost 11 years for the unknown reasons. I was just 16 years old back then, but the confession letter did not make sense. That is why it is not in circulation today. So, who started the fire? The keyword of this forgery is “auch” or “also”. Nobody starts a speech with a sentence, which includes word “also”. It was supposedly a recording of Himmler’s speech to the SS officers delivered in Oct. 1944 in Poznan, Poland. How do we know, it was really Himmler’s voice? 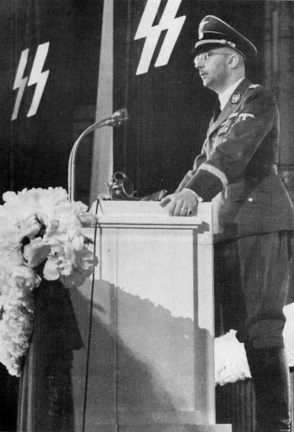 Have you ever talked to Himmler in person or heard many of his other speeches to recognize the voice? I am sure I haven’t. I don’t know what Himmler’s voice sounds like as much as I would not be able to recognize the voice of Abe Lincoln. “Himmler” is talking about June 30 of 1934, also known as “The Night of Long Knives”.It is an extremely under-researched event, except, it only proves that Hitler was extremely “bloodthirsty” and it doesn’t matter that most of the executions were done by his jewish bodyguard Emile Maurice. But in any case, I have a serious doubt that Heinrich Himmler would bring up the events of 1934 to justify what was happening in 1943. That lacks all the logics in there world. Edmund Heines. SA Gruppenführer. An open homosexual. Same charges as above. He was killed on the spot by Emile Maurice. And finally, SA Stab-Chef Ernst Röhm. He was the head of the fringe “second revolution” movement. Allegedly, he was executed by SS Gruppenführer Theodor Eicke, the founder of “The Dead Head” formations. The young officers of the SS in 1943 would not know much of it, or they wouldn’t even care what happened nine years ago. Himmler was smart enough and he would not bring up those events, as they had nothing to do with the situation in Europe in 1943. Thanks for posting this. I have heard the recording of the speech and the voice sounds harsh to me. I would not associate that voice with a man that looks like Himmler. He looks like a very mild-mannered man who would have a soft voice. His daughter Gudrun is still alive. I wonder what she has to say about all this. Photos of Gudrun show that she is still healthy and still beautiful. She seems to be the living proof of the healthy diet that Himmler advocated. Furtherglory/Webmaster, evidence on the Hungarian deportations and exterminations at Auschwitz had already been presented and discussed. See the Van Pelt report. See the report by Richard Evans. See Van Pelt’s testimony and Irving’s cross-examination, performed more than a week before Longerich took the stand. Irving failed to provide any response to this issue, as he largely focused on Hungarian Jews not sent to Auschwitz, instead of the hundreds of thousands who were. Of course, these Jews could not have been sent to the “East” in the summer of 1944, as there was essentially no East to send them to. The German army had largely been forced to withdrawal from the Soviet territories. In June, with Operation Bagration, the Red Army would wipe out the last major hold the Nazis had of occupied Soviet territories. Furtherglory/Webmaster, have you read the trial transcripts of the Irving-Lipstadt trial? Check day 24, when Irving and Longerich discuss the speech and its meaning. They don’t say anything about Evakuiering, but discuss the mass shootings that Himmler referenced. The Nazi mentality against the Jews during the Second World War has been the focus of some recent scholarship, such as Herf’s The Jewish Enemy. The association of Jews as a mortal enemy clearly helped fuel and drive the extermination measures from 1941 onwards. Also, if you read more of Longerich’s work instead of Wikipedia, you would know that he does accept a literal translation of the Wannsee Protocol of January 1942 about sending Jews to the East. Of course such a deportation program only focused on Jews fit for work and sought to work them to death over time, killing any Jews that survived. Those Jews unfit for work would not have made it that far. This illustrates that the judge was not paying attention and his short term memory was gone. It also shows that he didn’t know the first thing about the Holocaust or he would have known that almost all of the Holocaust survivors alive today were Hungarian Jews; the most famous Hungarian Jew is, of course, Elie Wiesel. Does the judge then ask if the evidence could be presented in court? NO! At this point, defense attorney Rampton speaks up and says, “It was called the Hungarian action and 450,000 Hungarian Jews were [….] gassed at Auschwitz.” I don’t know what was left out by Guttenplan when he put in … in the middle of a sentence in his book. Maybe he left out the word “allegedly.” But the important point is that the judge did not ask for any evidence to be submitted. It is very clear which side the judge was on. The Irving-Longerich exchange on several words was essentially a non-issue, as Irving simply highlighted what serious historians always knew. Certain words take on different meanings in different contexts. Note that Irving fully agrees that those same words can take on homicidal meanings, and he cites a few such instances. Today, he would be much more acceptable to words having sinister connotations, as he accepts the gassing of millions of people in various camps. Anyway, if you read the exchange you would have to agree then that the Wikipedia statement you quote about Dr. Longerich is incorrect. Regarding Judge Gray, who judged the case which Irving brought, Irving found several bright and favorable paragraphs in his judgment. Irving was lauded as an expert on the Third Reich and the Second World War by Gray, and many of his smaller points were accepted. In October 1940, Hungary had become allies with the Axis powers by joining the Tripartite Pact. Part of the deal was that Hungary would be allowed to take back northern Transylvania, a province that had been given to Romania after World War I. Hungarian soldiers participated in the German invasion of the Soviet Union in June 1941. On April 17, 1943, after Bulgaria, another ally of Germany, had refused to permit their Jews to be deported, Hitler met with Admiral Miklos Horthy, the Hungarian leader, in Salzburg and tried to persuade him to allow the Hungarian Jews to be “resettled” in Poland, according to Martin Gilbert in his book entitled “Never Again.” Admiral Horthy rejected Hitler’s plea and refused to deport the Hungarian Jews. On March 18, 1944, Hitler had a second meeting with Horthy at Schloss Klessheim, a castle near Salzburg in Austria. An agreement was reached in which Horthy promised to allow 100,000 Jews to be sent to the Greater German Reich to construct underground factories for the manufacture of fighter aircraft. These factories were to be located at Mauthausen, and at the eleven Kaufering subcamps of Dachau. The Jews were to be sent to Auschwitz, and then transferred to the camps in Germany and Austria. When Horthy returned to Hungary, he found that Edmund Veesenmayer, an SS Brigadeführer, had been installed as the effective ruler of Hungary, responsible directly to the German Foreign Office and Hitler. On March 19, 1944, the same day that Eichmann’s Sonderkommando arrived, German troops occupied Hungary. The invasion of Hungary by the Soviet Union was imminent and Hitler suspected that Horthy was planning to change sides. As it became more and more likely that Germany would lose the war, its allies began to defect to the winning side. Romania switched to the Allied side on August 23, 1944. I will give Rampton the benefit of the doubt. Maybe the court reporter didn’t get his words down exactly the way he said them. This part of the transcript shows why Irving lost the case. He should have had an attorney sitting at his table. When Rampton spoke out of turn, the attorney would have jumped up and said, “OBJECTION!!! Assuming facts not in evidence.” The exact number of Hungarian Jews who were gassed is not known. The judge was told that there was “evidence” of the gassing of the Hungarian Jews when, in fact, there was no “evidence” presented at the trial.